2015 Hyundai Sonata Pros and Cons: Why (Not) This Car? Though barely on anyone's radar 15 years ago, Hyundai has tripled its U.S. sales in the years since and aims to become one of the world's largest auto makers. Critical to achieving this goal: a top-selling midsize sedan. While Hyundai has been running its state-of-the-art Montgomery, Alabama, plant around the clock, the Toyota Camry outsold the Sonata by two-to-one. The Honda Accord, Nissan Altima, and Ford Fusion also handily outsold the Hyundai. Adding sales of the related Kia Optima would place the Koreans within striking distance of the second-place Honda, but the Hyundai folks prefer to treat their sister company as a competitor. So they'll just have to sell more Sonatas by further improving the car. The car's revolutionary 2011 redesign (reviewed here) boosted its sales by well over 50 percent. Only four years later, the Sonata has been fully redesigned again. Should we expect another dramatic bump? Interior styling is similarly much less dramatic. Why the 2015 Hyundai Sonata? I'll cut to the chase: the 2015 Hyundai Sonata is a much better car than the 2011-2014 Sonata. The problem: a number of current competitors are also very good. One thing that continues to separate the Sonata from the pack is a much longer standard warranty, five years / 60,000 miles instead of the typical three years / 36,000 miles. Hyundai's powertrain warranty is even longer, ten years / 100,000 miles--but this applies only to the first owner. The second owner gets 5/60 on the powertrain, which many competitors match. If you can get a feature on a competitor, you can likely get it on the new Hyundai Sonata. Available options include a panoramic sunroof, a heated steering wheel, heated-and-cooled front seats, heated rear seats, xenon headlights, full-range adaptive cruise control, forward collision warning plus automatic braking, blind spot warning, lane departure warning, and a nav system with both Apple Car Play and Android Auto support. Two features you can get on the Ford Fusion (if not the same Ford Fusion) but not on the Hyundai Sonata: a manual transmission and all-wheel-drive. Of greater importance for most potential buyers: the Sonata's available features are grouped in one or two large, expensive packages. With the Sport 2.0T, options are all grouped in a single $4,950 package. If you want the sunroof or the nav system with the turbo engine, you're paying for everything. The Sport 2.0T is visually distinguished by 18-inch wheels and quad exhaust outlets. New horizontal emphasis does increase perceived roominess. No aspect of the new Sonata received more attention from Hyundai's engineers than handling. Body rigidity has been increased by 41 percent through luxury-car levels of structural adhesives and high-strength steel. The front suspension has been revised and the rear suspension has been totally redesigned. The standard steering system has been reinforced and much more thoroughly fine-tuned, while the Sport 2.0T receives an entirely different system that locates the assist motor on the rack (instead of near the top of the column) for more nuanced feedback and a more precise feel. Do these changes make a difference? Absolutely. Compared to the 2014 Sonata, the 2015 feels much more stable and balanced. The new car's standard steering isn't as crazy quick right off center. Instead, it reacts much more linearly and precisely as the wheel is turned. Engage sport mode and both the new and old systems firm up nicely, but the new one feels less artificial. Step up to the Sport 2.0T and both feedback and precision improve as promised. The system with rack-mounted assist has a more direct, more nuanced (yet also coldly technical) feel so much like that in a Passat that I assumed (correctly, it turns out) that the Volkswagen must have been the engineers' handling benchmark. The Ford Fusion feels both more polished and less coldly technical than the Sonata, while the Mazda6 is the most lively handler of the bunch. But neither offers the firm steering of the Sonata's sport mode, so some people will prefer the feel of the Hyundai. A few caveats on handling before moving on. Unlike with the 2014 Sonata, the sport mode affects the drivetrain as well as the steering. And unlike in an Audi or BMW these effects cannot be customized. At around-town speeds the engine spins about a third faster in sport mode. So if you want the firm steering setting all the time you'll be spending considerably more on gas. I also briefly drove the Sonata ECO, which has a turbocharged 1.6-liter four-cylinder engine instead of the non-turbo 2.4-liter in the SE, Sport, and Limited. The ECO has the same chassis calibration as the 2.4-liter variants, yet to me its steering felt less linear and less precise--and more like the 2014s. Because the car was a prototype? Because I drove it on different roads? All in my head? Unclear. According to the spec sheets, the Ford Fusion has nearly as much combined legroom as the new Sonata, which has an inch more than the old Sonata. But Ford cheats the specs. In reality, the Hyundai's rear seat has a few more inches of rear legroom than the Ford's, and about as much as you'll find in any competitor. Rear headroom is in shorter supply, but (again as in most competitors) should be sufficient for people up to six feet in height. The rear seat cushion is a little too low and level to provide optimal thigh support, but the space to stretch out largely compensates for this. You can get rear air vents to help cool this roomy rear seat, but only on the Limited and Sport 2.0T. As Hyundai has improved its cars it has raised their prices, so they're not nearly as cheap as they used to be. With the 2015, though, Hyundai has cut the base car's price by $300, to $21,960. A 2014 Ford Fusion, with fewer standard features, starts over $800 higher. Even the Kia Optima starts a few hundred dollars higher. Oddly, Hyundai expects the Sport model to be the volume seller--perhaps because aside from lower profile tires its additional sportiness is entirely aesthetic (a more aggressively styled front fascia and dual exhaust outlets) while it adds popular features like a power driver seat, heated front seats, a rearview camera, and Hyundai's Blue Link telematics system. Stepping up to the true (or at least truer) sport model, the Sport 2.0T, adds most of the features also standard on the Limited (the top trim level with the 2.4-liter engine), including leather upholstery, proximity key, hands-free trunk release, automatic climate control, and a blind spot warning system. Plus a fashionably flat-bottomed steering wheel with paddle shifters, metal pedals, more prominent front seat side bolsters, even lower profile tires, and upgraded brakes. Congruent with this high level of standard equipment, the Sonata Sport 2.0T starts much higher than the Ford Fusion SE 2.0T, $29,385 vs. $27,735. Adjust for the Hyundai's additional standard content, though, and it has a $1,100 advantage. Fully equip both cars and adjust for remaining feature differences, and the Sonata emerges with a $2,000 advantage. The big question: do you actually want the features forced on you by the Sonata's option packaging? Why Not the 2015 Hyundai Sonata? There are no evident deal-killers with the new 2015 Hyundai Sonata. The best reason not-to-buy I can come up with is the car's exterior styling. It's far from ugly. But, unlike the 2011 when it was new, the 2015 will inspire no double takes. Hyundai claims that the new, "more mature" styling reflects the company's greater confidence and maturity. It no longer needs dramatic sweeps in the sheetmetal to force people to notice its cars. But I suspect a different motivation, or at least an additional one. The Sonata isn't only sold in North America. Midsize car buyers in Korea and China tend to prefer more conservatively styled sedans. Many of them found the swoopy 2011-2014 Sonata to be far too flashy. The new styling is likely for them rather than for North American buyers. The Sonata's interior has been restyled along similar lines, with fewer dramatic curves and more straight edges. The emphasis has shifted from vertical to horizontal, which does increase perceived roominess. Some design details have been borrowed from BMW. The trim plates have narrow indentations around the center stack's button banks. This center stack is slightly canted towards the driver. Plus the 2015 Sonata's interior materials are at least as good as last year's. Yet, because the new interior's styling is so conventional, it seems much less stylish, even dated. The Ford Fusion's interior, though not dramatically styled (you'll need the related Lincoln MKZ for that) remains more upscale in both design and materials. New grille looks like that of a Taurus to you? If so, you're far from alone. Among the roomiest rear seats in the segment. The 2011 Hyundai Sonata burst onto the midsize sedan scene with segment-leading power ratings. The 2.4-liter four-cylinder engine was good for 198 horsepower (200 in SE trim). The turbocharged 2.0-liter for 274. A funny thing has happened with the 2015 redesign: the peak power outputs of these engines have dropped to 185 and 245, respectively. Hyundai claims that these changes were made to boost power at low engine speeds--the revised turbo engine is a significant twenty percent stronger than before at 1,500 rpm. This should improve initial responsiveness in typical daily driving. But full-throttle acceleration doesn't feel as strong as before, even if the Sonata Sport 2.0T remains at least as quick as the Fusion 2.0T. It doesn't help the fun factor that engine revisions plus improved sound insulation much better block out desirable as well as undesirable engine sounds. The minority of midsize sedan buyers seeking pedal-to-the-floor thrills will want a V6-powered competitor. The 2.4-liter four delivers performance worthy of a quality appliance. Drivers who care little for rocketing away from traffic lights will find it thoroughly acceptable. The ECO's powertrain, a 177-horsepower turbocharged 1.6-liter four hitched to a seven-speed automated dual clutch manual (instead of the conventional six-speed automatic in the other variants), is much more likely to provoke complaints. In a brief drive around downtown Asheville this powertrain often hesitated, especially when in Eco mode. Acceleration was neither smooth nor linear. When creeping along at slow speeds (such as in heavy traffic or in a parking lot) the dual-clutch transmission shuddered slightly (a common complaint with the similar unit used in small Fords). Hyundai won't offer the ECO until the fall. Further development could take care of these issues. You sit lower relative to the instrument panel in the 2015 Sonata. To compensate, I raised the seat an inch or so--something I felt no need to do in the 2014. The instrument panel is also quite deep. Though the driving position in the Ford Fusion suffers from similar shortcomings, those in other competitors do not. You sit higher and the windows are larger and more upright in a Honda Accord or Subaru Legacy. And the driving position in the Mazda6 is nearly ideal for sport-minded drivers. Bear in mind that I'm only 5-9. Tall drivers will appreciate the new car's lower default driving position, so it could be a reason to buy for them. And the front seats themselves? Fore-aft support in the new Sonata is quite good, especially in the Limited and Sport 2.0T, where the driver seat's lumbar adjustment is four-way. The headrest doesn't jut as far forward as that in the Fusion, a big plus for those of us with relatively upright necks. But the seat bolsters, even the enlarged ones in the Sport 2.0T, are spaced more widely in the 2015 Sonata than in the 2014. So those of us with relatively slender builds will have to slide back-and-forth a bit to encounter lateral support in hard turns. The bolsters in the 2014 Sonata and in the Ford Fusion provide more continuous support. The Hyundai Sonata SE earns EPA ratings of 25 mpg city, 37 mpg highway, while the Sport and Limited with their slightly grippier tires check in with 24/35. These scores aren't quite as high as those of the Mazda6 and Nissan Altima. If you want a 38 mpg highway rating, plus a 28 city rating, you'll have to wait for the Sonata ECO, which will reach dealers in the fall. The Sport 2.0T EPA ratings of 23/32 are actually more competitive. The Ford Fusion 2.0T and Nissan Altima 3.5 match this engine's combined 26 mpg rating, but no similarly powerful competitor tops it. None of my test routes included badly damaged roads, so a thorough evaluation of the 2015 Hyundai Sonata's ride quality will have to wait until I can drive the car back home in Michigan. For now I can report that the ride generally felt stable and composed, if not quite as tightly controlled and polished as the Fusion's. Some ripply road surfaces affected a mild jiggle in the Sport and Sport 2.0T. The 2015 Sonata is quieter inside than the 2014, with engine noise most dramatically reduced. But a few competitors, including the Cheverolet Malibu and Ford Fusion, remain quieter still. By many objective measures, the 2015 Hyundai Sonata is a better car than the 2014, with an especially large improvement in steering and handling. The Sport 2.0T out-VWs the VW. When the road turns twisty, the new car inspires far more confidence than the old one. Perceived roominess is up, noise levels are down, and fuel economy remains competitive. The new car's shortcomings are primarily subjective ones, meaning that they might not be shortcomings for you. The new styling is less dramatic. And the revised engines trade some full-throttle acceleration for everyday driveability. Those seeking a car that is exciting to look at and drive, and who don't need a lot of interior space, will likely end up with something else; perhaps the Ford Fusion or (if handling is a higher priority than acceleration) the Mazda6. But those seeking a thoroughly competent midsize sedan that performs admirably in a wide range of conditions could bring Hyundai the sales gains it seeks. 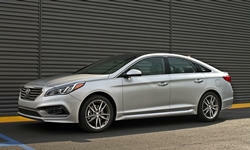 Anyone considering a Honda Accord, Nissan Altima, or Toyota Camry should also consider the new Sonata. Peak output is down by 29 horsepower, but there's a 20 percent bump at 1,500 rpm. Hyundai provided insured, fuel cars plus a night in a hotel and three meals. Worth Green of Asheville Hyundai (828-298-4911) helpfully provided a test drive in a Sonata SE. Brian Newman of Asheville Ford (828-253-2731) did the same with a Ford Fusion. 2015 Hyundai Sonata pros and cons, according to Michael Karesh: the best reasons for buying (or not buying) the 2015 Hyundai Sonata. Join TrueDelta to post your own impressions. It's funny how different people see different things in cars and have different desires. I loved the lower seating position and like sitting that way rather than higher-up. I sat in the back too and loved the ride quality Over truly-bad roads in the Bronx. I wish the Chrysler200 had this much space. It will however benefit from offering V6, Nav, moonroof and AWD at less than the price of an optioned out 2.0t (>$35,000). Thanks for the comment. I've added a note that tall drivers could have a different opinion of the new, lower default driving position. My issue (which isn't a large one) is mostly with the depth of the instrument panel, which seat adjustments cannot mitigate. Good to hear that the car rides well on bad roads. As noted in the review, I haven't yet been able to test the car on bad roads myself. Thanks for the review. I test drove an early production 2015 and concur with your thoughts. I would add that the new side windows are just over an inch taller, greatly improving visability over my 2011 Sonata. Also, the little window near the C-pillar was re-shaped to now be actually useful. Subjectively, the newinterior is a friendlier place to be. My gray-black 2011's cabin reminds me of being in a coal bin. A lot of 2011 road noise has been eliminated in 2015. I'm concerned that Hyundai'sAlabamaplant is working beyond its design capacity to keep up with sales. I'll watch the situation before buying a 2015, particularly since my Columbia, Mo. dealer is reluctant to handle warranty work. The Fusion has not only a Lane Departure Warning but it steers you back into the lane (Lane Keep Assist). The Sonata doesn't have that feature. Thanks for the review. Pretty positive except for ECO model and styling. If the ECO DCT shifts as you decribe here there will be complaints as there are with the Ford DCT. I could probably deal with the manual-like low speed shifting quality as long as it does this for 250,000 miles. I'm still waiting to see the long term reliability of the Ford DCT. I see there have been issues with the seals and clutches, at least on the earlier models. This leads me to the question of whether people will pay $2000+ for the rougher shifting ECO model to get a couple more mph. How many years to break-even? Perhaps there is more content included such as with the PEP packace on the SE? Is PEP still available as an add-in to the SE? As the owner of a 2011 I've having a hard time getting excited about the styling and dashboard. Ford Taurus grill. Ouch. I suspect your comment about Asian sales may be on the mark. Then again, people tend to like conservative styling. One other thing I don't care for is that the car is 1.3" longer and 1.2" wider than the prior series. Stop with the size-creep. My garage isn't very roomy. Have an ECO for 5 months, 8k miles so far. Yes, it feels like a robo manual but is very smooth compared to an actual MT. I owned a 2011 Sonata 6 MT prior to this. No significant lag at low speeds on mine. Fuel economy is its bright spot, especially on the freeway. Tanks FE averaging 39mpg and 40-46mpg on my daily 75 mile round trip**. Really good for a full size sedan in my book. ** I drive with a feather foot AT posted 55-65mph speed limits. Your mileage may vary. That is outstanding fuel economy. I did drive a pre-production prototype. They likely made further software tweaks before production.